wagnerThe first opportunity for teams to improve their rosters in a meaningful way is just around the corner with the start of free agency. Everybody wants to build through the draft, as that route is cheaper and you can potentially see your new acquisition form a key piece of the roster puzzle for a longer period. That said, free agency can provide teams with an immediate and dramatic upgrade at key positions with proven NFL commodities—if they are willing to pay the asking price. Smart teams don’t just draft well, but are adept at negotiating the risks in the talent pool of free agency, adding players to the roster without detonating the salary cap. The only thing keeping Campbell from being higher on this list is age, as he will enter the 2017 season north of 30 years old for the second time in his career. Campbell, though, is coming off the best season of his NFL tenure, recording 56 total QB pressures and 34 defensive stops in 2016. He maintained his strong run defense and improved as a pass-rusher. The way Arizona has deployed him, Campbell can play in any scheme, and has effectively lined up at 3-technique (the traditional pass-rushing alignment of a four-man D-line defensive tackle) more often than any other spot for the Cardinals, despite their base defensive front. The offensive lineman group in free agency is headed by Kevin Zeitler and T.J. Lang, who are both Pro-Bowl quality guards on the right side of 30. Zeitler is the more balanced of the two in terms of run blocking and pass protection, and is also two years younger, so he narrowly edges Lang as the best available lineman, but depending on the system you run, a team might easily view Lang as a better fit. Lang is two years older than Cincinnati’s Kevin Zeitler, but like seemingly all Green Bay offensive linemen, he is one of the best players in the league at pass blocking. This past season, Lang didn’t allow a single sack or hit on quarterback Aaron Rodgers, and surrendered just 10 QB hurries all season, despite Rodgers recording the second-highest average time to throw in the league. If you are a team in need of guard help, and the passing game is the foundation of your offense, Lang would be your ideal target. Dont’a Hightower is an impact player, but has a very specific skill-set that the Patriots have been able to utilize extremely well. He has good grades in every area of the game PFF measures in three straight seasons, and has been used heavily by the Patriots as a pass-rusher on the blitz—typically up the middle to augment their relatively average pass rush up front. Over the past three seasons, Hightower has recorded 18 total sacks and has averaged 32 total QB pressures per season, as well as being a solid run defender. The less space he has to play in, the better, but Hightower can be an impact linebacker for most teams. Gilmore is arguably the only available cornerback that a team could expect to thrive as a No. 1 corner, but his 2016 season calls into question how confident anybody can be in handing him that role, given how poor his play was at times. For the season, Gilmore notched five picks, but that masks much of the poor play, and the 15.6 yards per reception he was beaten for represents a career high. Any team handing him a big-money deal will want to be confident that 2016 was more anomaly than baseline. 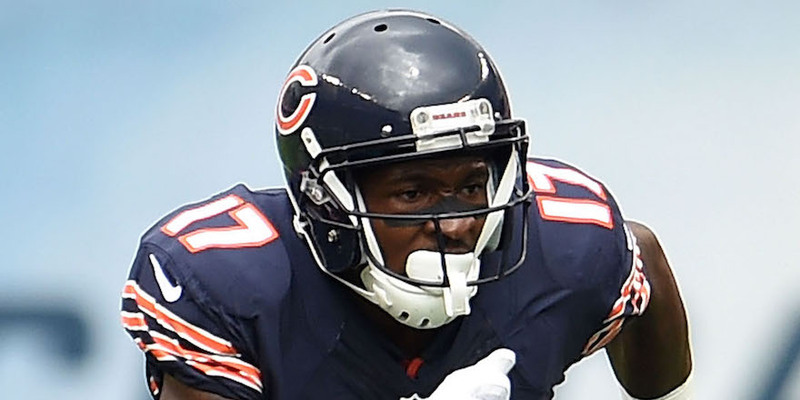 Alshon Jeffery is another player with the potential to be elite at his position, but between average play in 2016 and a series of injuries that have affected his availability over multiple years, his value and desirability to teams has taken a hit over recent seasons. Jeffery played in 12 games this past season, catching 56.5 percent of the passes thrown his way and dropping a career-high five balls. A.J. Bouye was one of the breakout players of the 2016 season, likely earning himself a lot of money. The risk is that anybody handing him that contract is working from just one season of tape, but it was one consistent season—the expected regression never really came—and it does feature 17 games, thanks to Houston’s playoff campaign. Over the year, Bouye allowed just 50.5 percent of passes thrown his way to be caught for a passer rating of 58.5 from opposing QBs. Even at his best, Nick Fairley has always seemed like a player with more in the tank, but 2016 saw him play more snaps (723) than any other season of his career, and end the year with career-highs in sacks (seven) and total QB pressures (47). With a limited pool of interior linemen, Nick Fairley brings serious upside, albeit with some risk. The only thing keeping Whitworth this low on the list is his age (35). Despite those advanced years, he remains one of the league’s best offensive tackles, surrendering 14 total QB pressures over the 2016 season. The Bengals have likely learned over the season that they can’t allow him to hit free agency, but if he does, he will have no shortage of suitors. As long as you accept that you’re not in it for the long haul given his age, Whitworth is one of the best potential short-term upgrades slated to hit the market. The Patriots have never given Duron Harmon more than 700 total snaps over a season, including the postseason. He has been effectively a nickel safety for the team, but has earned solid or good coverage grades in every season of his career, and is a player that has proven ability to play deep off the line of scrimmage and still influence play. Teams have no shortage of strong safety options, but a legitimate talent at free safety is a rare prize, and that could see Harmon’s value boosted significantly in a seller’s market. Contract years typically see the best performance possible from a player looking to make as much money as they can, but Brandon Williams is scheduled to hit free agency coming off the worst year of his career. He was still solid against the run this past season, but the two previous years he had shown ability comparable to that of Giants defensive tackle Damon Harrison—the game’s best run defender. Like Harrison, Williams offers little as a pass-rusher, but Harrison showed last offseason that the league is still willing to pay for an elite run defender. Williams will have to hope that 2016 didn’t call his status in that category into question. A former undrafted free agent, Tony Jefferson has developed into an excellent strong safety and box defender for the Cardinals, and this past season, he earned a PFF run-defense grade 98.0. Jefferson recorded 35 defensive stops, third among all safeties, and missed only five tackles, less than half the figure of either of the players to better him in defensive stops. Jefferson has been solid in coverage close to the line of scrimmage, and would be a solid upgrade for teams looking for an upgrade at the position. Terrelle Pryor didn’t quite manage to make Charles Woodson look like a genius with an 1,800-yard season—as difficult as that may be to believe—but he did top 1,000 receiving yards and notch 77 catches with the Browns while cycling through a laundry list of quarterbacks, most of whom did no favors at all for their receivers. 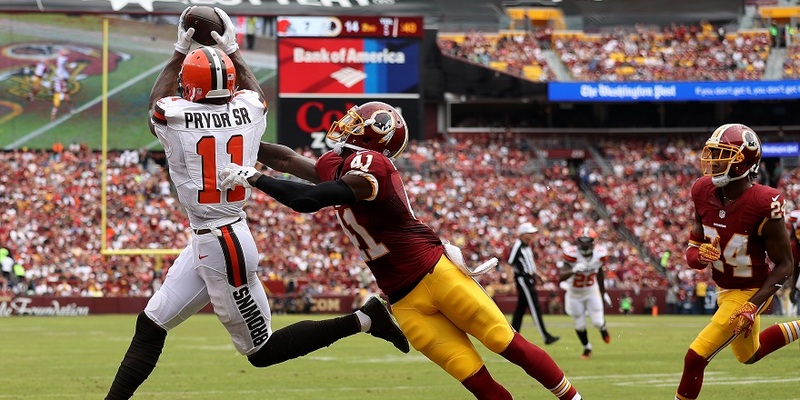 This was Pryor’s first real season as a wideout, and his potential remains extremely high given his athletic talent. He may never develop into the next Julio Jones, but he has already shown the ability to be a difference maker for any team as a starting option. Larry Warford has never really repeated the highs of his rookie season, but he remains a solid starting guard at just 26 years old. This past season, Warford surrendered three sacks and 28 total QB pressures, but teams will be intrigued by the prospect of rediscovering the 2013 PFF Rookie of the Year, who didn’t allow a single sack and earned the best run-blocking grade of his career. There are few more anonymous quality players than Washington’s Chris Baker, who for the past two seasons has posted impressive grades against both the run and pass as he has seen his role on defense increase into a starting job. He has averaged 42.5 total pressures over the past two seasons playing defensive end in Washington’s scheme, and has been a tough run defender in each year. Maybe a free-agent contract will give him the recognition his play deserves. It’s easy to think of Ronald Leary as a backup lineman, but he was a starting guard who lost his job because Dallas lucked into La’el Collins in freakish circumstances at draft time. With Collins injured this season, Leary stepped back into the starting spot at left guard in Dallas and actually upgraded the unit. Leary didn’t allow a sack all season, but it was his run blocking that was the biggest difference, and he was not an insignificant part of Ezekiel Elliott’s league-leading season running the football. Dontari Poe has rare ability for a nose tackle, and can do things at 346 pounds that players 20 pounds lighter can’t from a movement standpoint. His 2013 season represents his potential. That year, he was an excellent run defender and brought enough as a pass-rusher in collapsing the pocket up the middle; what’s more, did it while playing a crazy 1,063 snaps for a nose tackle. The issue is, though, that Poe hasn’t hit those heights since. He is just 27 years old, however, and teams will want to chase the potential he has at least proven capable of in the past. At this point on the list, the search for a No. 1 corner is over, but teams can still find capable starters, and Logan Ryan is one of those. He can be exposed at times, especially against smaller, quicker receivers, but he is a solid and reliable player and is more active in the run game than many players at the position. Ryan could be a very nice fit in the correct scheme, but isn’t right for every team. A year ago, Sheard was coming off the best season of his career for the Patriots, and though they dialed back his playing time a little this year, he still played just seven fewer snaps over the entire season than he did in 2015 (albeit with an extra game in the Super Bowl giving him an extra 94 possible). Sheard is a capable player against the run and pass, and can play across different schemes and roles. He may never be an All-Pro, but he can be a valuable part of a team’s defensive front. 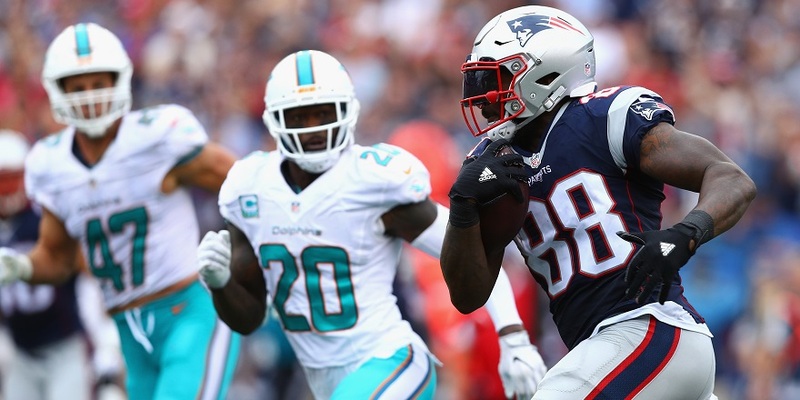 We saw early in the season the kind of potential that Martellus Bennett has when he was ably filling in for Rob Gronkowski, and he deserves significant credit for gutting it out over the season and playing through injuries for the Patriots. That said, it did clearly affect his play. Bennett is one of the league’s most talented TEs, capable of excellent work as a receiver and blocker, but has rarely put it all together for extended stretches of play, and will be 30 by the time the new season rolls around. DeSean Jackson is still one of the league’s most dangerous deep threats, capable of making a big play at any time. In 2016, only T.Y. Hilton had more receptions on deep passes (20+ air yards) than Jackson’s 16, and he scored three times, netting 579 yards (the most in the league) on deep targets alone. He has never been the most complete receiver in the game, but deep threats are a valuable part of NFL offenses, and Jackson is still among the best available. Morris Claiborne is an interesting player for teams to evaluate. He was the No. 6 overall pick in the 2012 draft, then had four years of below-average play before completely turning things around in 2016—only to go down injured for the second half of the season. He has half a season that suggests he can be a legit high-end starter, but that’s it. The improvement in his play for 2016 was incredible, but there is a lot of bad tape before it, and a small sample size within that improvement. Prince Amukamara likely won’t ever justify his first-round draft status, but he isn’t a bad player in the right scheme if a team doesn’t ask more from him than he is capable of. Amukamara doesn’t have great ball skills, and will be beaten on occasions, but teams in need of a third cornerback to play the outside could do a lot worse. Pierre Garçon’s issue is advancing age, because on play alone, he would be far higher. He ended 2016 with a PFF grade of 85.8, good enough for eighth among all wideouts, and he has a complete skill-set, able to beat people with speed, power and gain yards after the catch. He dropped only one pass in 2016 from 110 targets, and even had a solid blocking grade. He won’t be a long-term answer for anybody, but may be among the better immediate-impact signings. Kenny Britt gained over 1,000 receiving yards with Case Keenum and Jared Goff throwing him the football in 2016. That alone is worth some pretty serious respect. Britt caught 62.4 percent of the passes thrown his way (higher than the completion percentage from either QB overall on the year) and was excellent at making contested catches. 2016 was the first season in his career that Britt has really been heavily targeted, and he rose to meet the increased workload. Barry Church has been a solid player for the Cowboys, especially against the run, but 2016 marked a dramatic uptick in his performance in coverage. Some of that was cutting down on the number of missed tackles—halving his total from 2015 to 2016, in fact—but he also saw more action deeper in coverage, which played more to his strengths. There isn’t a whole lot of tape on J.C. Tretter (his career is 1,001 snaps old, which amounts to effectively one full year of starting), but what is out there is pretty good. His grade over that thousand snaps would put him among the top 15 players in the league at his position, and in 2016, he ranked ninth overall with a grade of 84.1. He hasn’t really shown limitless upside, but his floor would appear to be a capable, solid starting center, which makes him a valuable commodity. Few players have covered more of the grading spectrum than Ricky Wagner over the past three seasons, who has bounced from grades of 84.7 to 45.8, and back up to 84.5 again in consecutive years. At his best, Wagner has been a good pass protector and passable as a run blocker, which is a serviceable combination for most NFL teams. That said, teams will want to understand what happened in Wagner’s 2015 season before committing significant money. John Cyprien earned the highest PFF run-defense grade we have ever given a safety, ending the 2016 season with a mark of 98.8 as he found his home closer to the line of scrimmage within the Jacksonville defensive scheme. His coverage was still far from ideal, but his run defense was legitimately impactful, and only Giants S Landon Collins had more defensive stops at the position. Cyprien’s issue is that he has just one season of improved play, and there are many other capable safeties available to fill the role. Before injury, John Simon was chipping in well as a pass-rusher in the Houston defense that was able to generate pressure from a lot of different players. His run defense has been good in each of the past three seasons, but 2016 saw him far more efficient in his pass rush, with 26 total QB pressures and two batted passes in his 205 pass-rushing snaps. This was the highest percentage of the team’s defensive snaps that Simon has seen in his career, and his best performance individually, so he will likely be pushing for a starting spot in free agency. Another in a line of one-season wonders at safety, D.J. Swearinger completely turned around his career in Arizona this season after previously being at the heart of seemingly every coverage bust in the Houston defense. Swearinger looked like a far more confident and instinctive player in Arizona, but the fact that it’s just one year of play has to make teams wary. Bradley McDougald has been an inconsistent player for the Bucs, but the high points of his performance are very good, and if a team can iron out the bad, he could be a very useful player. McDougald is extremely active, having made over 75 solo tackles in each of the past two seasons; he also has 13 pass breakups over his three-year career. Back in 2014, Eddie Lacy was the third-highest-graded RB in the league, with an overall grade 86.0 (that would have ranked second in the 2016 season), but much-publicized weight issues and injuries have held him back and thrown his career into question. If a team can get his weight on point, there are few backs that can have the kind of overall impact he can have on an offense, but that has become a bet with pretty long odds over the past two seasons. Injuries are a major factor, but when he is on the field, DeMarcus Ware can still bring the heat off the edge. Even in 2016, Ware recorded five sacks and 26 total QB pressures from just 213 pass-rushing snaps. He probably makes the most sense as a situational pass-rusher for a team now, but he can still be among the better players in the game within that role. Johnathan Hankins put on tape the anti-contract year in 2016. While most players have the best year of their career with a big payday on the line, Hankins had the worst year of his career. With Damon Harrison coming on board, Hankins was shifted along the defensive line to accommodate him, and wasn’t nearly as successful playing as more of a three-technique, penetrating style of defensive tackle than he was over the nose in previous years. He has never been much of a pass-rusher, but could be a solid run defender for a team that puts him back in his old position. Dre Kirkpatrick has improved dramatically, but has still only really been passable as a starting corner for the Bengals. What makes him interesting, though, is that Cincinnati’s scheme doesn’t really play to his strengths, and he may prove to be a far more effective cover corner in a scheme that operates more pure man coverage. This past season, he allowed just 10.0 yards per reception and a passer rating of 68.9 when targeted. Both were the best marks of his career. Sometimes the league decides certain offensive lineman are backups or sixth-men going forward when they have never really done anything to suggest they aren’t better than that, and I think that could be the case with Wisniewski. Over his career, at either guard or center, he has never been significantly below-average for a season, and could likely upgrade multiple spots for several teams across the league. Cornerbacks that are termed “sub-package only” were once one of the last things a team needed to get in place, but in today’s NFL, those players are playing two-thirds of their team’s defensive snaps, so they need to be capable. Captain Munnerlyn has been solid at worst for some time, and far better than that at points over the past few seasons. His play tailed off over the 2016 season, but there is certainly something to work with. Mike Glennon has been average over his 1,256 career snaps, but it’s how that average play has been accomplished that makes him at least intriguing to a QB-starved league. Glennon has tended to be either very good, or very bad in any given game, and then swung back in the other direction. Much of that is directly down to how much pressure he was under in the game, but he has at least shown enough good in his young career to tempt some teams desperately in search of an answer at the position. LeGarrette Blount was the hammer of the Patriots’ offense this past season. When they needed to pound the football and run with power, they handed him the ball, and it worked. He finished 2016 with a league-leading 18 rushing touchdowns and the second-most carries, with 299. Blount is somewhat one-dimensional, but he is a good power back. Newman’s play alone would put him at the sharp end of this list, but at 38 years old, he isn’t a risk many teams will be keen on taking, and is likely only a one-year stopgap for somebody if they suddenly find themselves with a hole in their CB depth chart due to injury. Newman allowed 0.57 yards per coverage snap in 2016, the best mark in the NFL. When healthy, Kendall Wright is a dangerous slot receiver that can play outside and make big plays for his team. He has quickness, speed and impressive route-running skills, but has now missed time in each of the past three seasons, and hasn’t had a 1,000-yard year or over 60 receptions since 2013. Chris Long became a situational pass-rusher for the Patriots this past season, and though he didn’t have the best season of his career, he showed he could still make crucial big plays, including in the Super Bowl on his limited snaps. Playing second-fiddle to Dez Bryant for the Cowboys, Terrance Williams has largely seen a career limited by lack of opportunity, but he has proven to be productive and has the skills to make big plays. His career average per reception is 16.2 yards, with 4.7 of them coming after the catch, and he has receptions of at least 42 yards in every season. Williams may have more in the tank if he becomes a larger part of a new team’s offense. The Jets cut Nick Mangold loose after an injury-plagued season, and it’s clear that he is no longer the force he once was. Mangold at his best was the top center in the game, but even at his current level, he remains an adequate starter, and hasn’t surrendered a sack in his last 33 games. Latavius Murray is a solid running back option, but likely sees his market depressed with a draft class stacked full of backfield talent just around the corner. Last season, he averaged 2.6 yards per carry after contact behind one of the league’s better run-blocking offensive lines, but had only 207 carries. In the three games in which he carried the ball 20-plus times, he averaged 4.8 yards per carry. Concussions complicate Shields’ prospects, and they shut him down in 2016 after just 62 snaps, but if he is medically viable he is still a quality starter that can help teams in need of coverage on the back end. Injuries saw John Sullivan lose his starting center job in Minnesota before spending 2016 as a backup in Washington, but at his best he was among the league’s best centers. He may be over 30, but offensive linemen often play well deep into their 30s and he could be a surprise upgrade for some team. Sterling Moore won’t ever be an elite, high-end corner, but in a league that needs to be three-deep at the position, he is a more-than-capable second or third option. Over the past two seasons, Moore hasn’t been beaten for a pass longer than 40 yards despite 148 targets being sent his way. At his best, Leon Hall was arguably the best slot corner in the game, and while injuries have knocked his career off the rails, he is still a very capable sub-package player, and has never earned a below-average coverage grade in any one season of his career. The following players were on the original top 50 list, but have since been removed due to being placed under the franchise tag or signing a long-term contract. Was No. 1 overall, placed under franchise tag. There is little to no chance that the Pittsburgh Steelers allow one of the league’s best running backs to hit the open market. Le’Veon Bell is a complete weapon for Pittsburgh, and one that helps them immeasurably as both a runner and receiver. He has had some issues with suspensions that make long-term contract negotiations interesting, but he is currently the best player scheduled to hit free agency. Was No. 2 overall, placed under franchise tag. Kirk Cousins is not the best player scheduled to hit free agency, but he is by far the best quarterback, and in today’s NFL, that makes you an extremely valuable prize, vaulting him up the list. Cousins backed up his 2015 season and has earned himself a long-term deal—and it should be Washington that gives it to him. When kept clean in the pocket this past season, Cousins’ passer rating was 107.2, and he completed 72.3 percent of his passes. Was No. 3 overall, placed under franchise tag. For the first three weeks of the season, Kawann Short was missing in action. From then on, however, we saw the player that excelled in the 2015 season, and Short became a wrecking ball in the heart of the Carolina defense for much of the remainder of the year. He ended the season with 49 total QB pressures and 38 defensive stops, earning impressive grades against both the run and pass. Was No. 4 overall, placed under franchise tag. Melvin Ingram has developed into the first-round pass-rushing force the Chargers thought he could become, just in time for him to turn the performance into a big-money contract from somebody—whether that’s with the Chargers or on the open market. Ingram finished the year ranked as the sixth-best edge defender in terms of PFF overall grade (88.1)—just behind teammate Joey Bosa, in fifth—recording 72 total QB pressures over the season. He also showed the ability to play in coverage more than most edge rushers, batting away two passes and allowing just 6.8 yards per reception. Was No. 6 overall, placed under franchise tag. The Cardinals have another impactful defensive player scheduled to hit free agency, potentially putting the team in a bind in terms of trying to retain their own players. Jones was picked up from the Patriots in the offseason, as New England was looking to move on from a player that had some strange off-the-field behavior incidents. That said, Jones had a fine year in Arizona, boosted by some of the offensive lines he got to play in the NFC West. Jones racked up a dozen sacks and 66 total QB pressures this past season. Was No. 7 overall, placed under franchise tag. Jason Pierre-Paul went down injured 32 snaps into his Week 13 matchup with the Pittsburgh Steelers, but despite that, still ended the season with more snaps on the edge than all but 18 other players. JPP played over 90 percent of possible snaps over the season, and posted 54 total QB pressures across 12 and a half games. He is still just 28 years old and could be an impact pass-rusher for somebody. Was No. 8 overall, signed to six-year deal. Eric Berry is one of the league’s most versatile safeties, and showed in 2016 that he has the ability to succeed as a deeper-lying free safety, as well as in the box and around the line of scrimmage. That’s a huge boost for his free-agent value, because free safeties are becoming increasingly hard to find in a league that isn’t struggling to find those that can play in the box and around the line. Berry has had arguably the best two years of his career since returning from battling cancer, and has done so in two distinct alignments for the Chiefs. Was No. 15 overall, re-signed with Packers. Nick Perry is another former first-round edge defender that took some time to get going in the NFL, but has started to look worth the draft status lately. Perry posted career-highs in snaps, sacks, total QB pressures, defensive stops and more or less every other statistical category you choose to mention for the Packers this season. He is a player that might be better suited playing consistently with his hand in the dirt as a 4-3 defensive end. Either way, Perry has the position flexibility to make him an option to any scheme in the league. Was No. 25 overall, placed under franchise tag. Trumaine Johnson has the size (6-foot-2, 204 pounds) that the NFL covets at the cornerback position, but he just hasn’t been able to consistently put his best play on the field, and should be considered a solid No. 2 corner more than a No. 1 at this point. Over the past two seasons, Johnson has surrendered an average of 591 receiving yards and 2.5 touchdowns while allowing receivers to catch over 60 percent of passes thrown into his coverage. Was No. 39 overall, reportedly set to sign with Giants. Marshall is just a year removed from a 1,500-yard, 14-touchdown season with Ryan Fitzpatrick as his quarterback, and even in 2016, he gave CB Richard Sherman all he could handle, scoring a touchdown and gaining 89 yards against the Seahawks. At 32 years old, and coming off such a down year, though, he is a risk. Was No. 41 overall, signed to three-year deal. Mario Addison improved dramatically in 2016 and had the best single season of his career without dramatically increasing his playing time from the previous two seasons. He ended 2016 with just 433 snaps on defense, which is actually lower than the two previous years, albeit a higher percentage of the team’s possible snaps. That said, he recorded career highs in sacks (10), total pressures (51) and defensive stops (18). Addison could just be hitting his prime and has never been afforded a starting role, making him a very intriguing option for teams. Was No. 42 overall, signed to two-year deal. Harrison likely plays in Pittsburgh next season or nowhere, but maybe the right team could tempt him into a short-term deal somewhere to chase a ring. The Steelers have been trying to replace Harrison for years, yet he remains easily their best pass-rusher, and effectively forced them to put him back in the starting lineup this past season. He was the Steelers’ best player in the postseason on defense, and can still affect games, even at a ludicrous 39 years of age. Was No. 47 overall, re-signed to two-year deal by Panthers. Though he hasn’t come close to replicating his best seasons, Charles Johnson has actually played reasonably the past two years. His pass-rush threat has diminished, but his run defense has been better than it has ever been, and he still brings more pressure than his sack totals would suggest, averaging 37.5 total QB pressures over the last two seasons, despite playing only 542 snaps each year. Given the drop in his reputation, he might prove to be a value pickup for some team.